I was about 15years old when I came across the word Africanist. I was arguing with my Friends about Music and other things. I have a great taste for African Music & Fela Music is my Pick. My friends talked about their Great love for Hip hop and Rap Music which I really don't find interesting but I think Everyone has their own Choice and people's choice should be respected. My friends tried to Convince me about changing my taste of Music which I really don't like. So I decided to Quote a line from one of my favourite Fela songs which says ' the thing way black nor Good na Foreign things them dey like! It's ColoMentality! ' My well meaning friend Obiajulu looked at me and said ' Well do you know you're an Africanist '. I smiled & pretended to know the Meaning of Africanist and brushed the topic aside and the discussion continued on and on. I was bordered, because the inflection my friend placed on the word ' Africanist ' is not a very good one. He said it with a funny face and made it sound like the Word ' Africanist ' is a bad thing. The Anecdote I told above wasn't my first discovery of the Word ' ColoMentality ' but if not for Anything its just an Ode to Africanism. Well for Non - Nigerians and Africans in diaspora; When Fela talked about ColoMentality he was referring to Blacks who are not comfortable with their Skin Colour, the texture of their Hair and even the Colour of their Eyes amongst other things. ColoMentality literally translate into Colonial Mentality and it's no News that Majority of the African Nation was Colonized by the 'british master'. ColoMentality is actually a Mentality created by Blacks that Supports White Supremacy and as such Blacks must try their best to be 'white' and in an Attempt we(Blacks) bleach our skin to suit their sight and we relax our hair in a limp attempt to make it straight. The funny thing is that ColoMentality has being the order of the day. We no longer bear our African Names, We now have 'English ' name in place of our African names. Being Black comes with Lots of Baggage ( both positive and negative baggage), and to make issues worst, the word 'Black' has always been used to portray Negativity ranging from Black Mail,Black list, Black Market and even Black Friday which I really find demeaning. I have since come to appreciate the BlackBerry smartphone because its the only word that portrays anything ' smart ' about the word ' Black '. Now is the time for us to fight against ColoMentality! We should accept ourselves just the way God created us. Life on Earth is very short and anytime we pretend not to be our truest self,anytime we pretend to be 'white' then it's a gross waste of time. Am not fighting against Technology or Kicking against Whites but it's just a call for Blacks to accept themselves and as such carry every baggage that comes with Being Black. I went home that day and I checked the Meaning of Africanist and it wasn't a Bad thing. 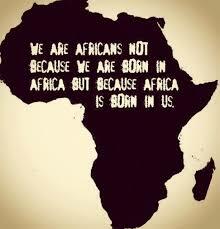 It was a very good thing and it delighted me then to know that am an Africanist and I choose to be identified as one.